Netherbury is an attractive village situated in West Dorset, close to Beaminster. Surrounded by wonderful countryside, the village itself has a population of about 1300 (according to the 2011 census). In the north of the village is the handsome St Mary’s Church with a chancel and nave that date back to the 14th century. 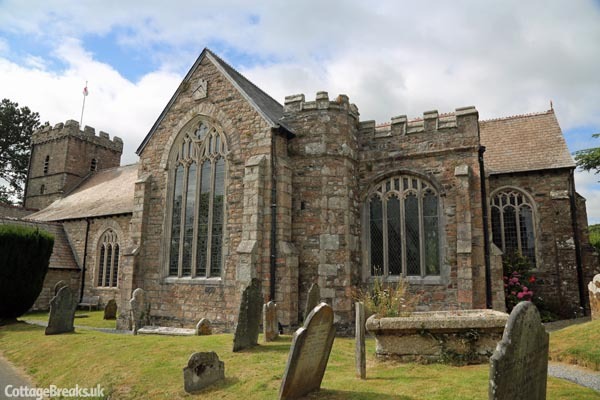 The church, which was restored in the 19th century, contains interesting monuments including one for Admiral Sir Samuel Hood – one of Nelson’s Band of Brothers who was born here. 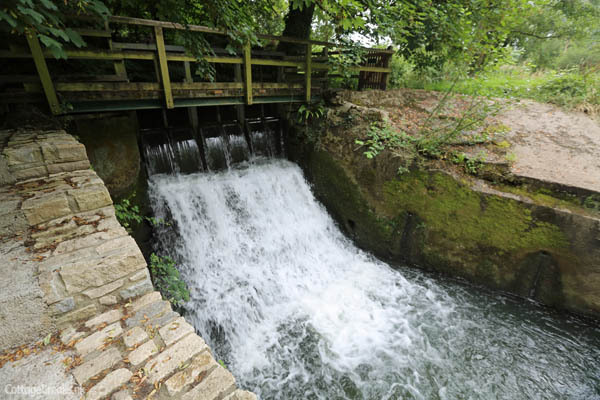 Netherbury is home to the original River Cottage, used by Hugh Fearnley-Whittingstall in the series of the same name, which is a game-keeper’s lodge in the grounds of Slape Manor, a grand house originally belonged to the Strode Family. Here are some photographs taken in 2014 in Netherbury. St Mary’s Church, Netherbury. The oldest bell in the tower is from 1610 and a fund has been set up to assist with the church bells restoration. Inside the church is a memorial for three gallant sailors from the Hood family, including Admiral Samuel Hood who served under Nelson. The village is located on the River Brit. 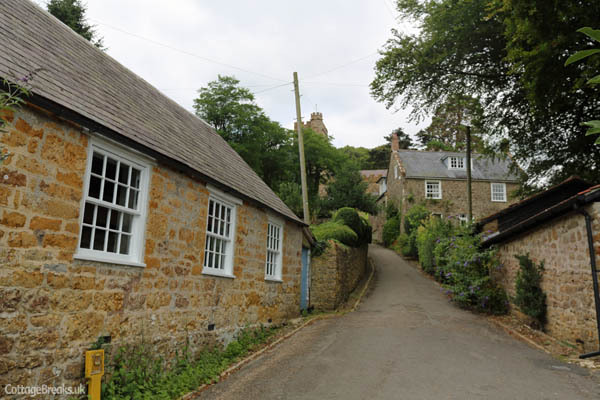 The village is very picture-esque and a great location for country walks. 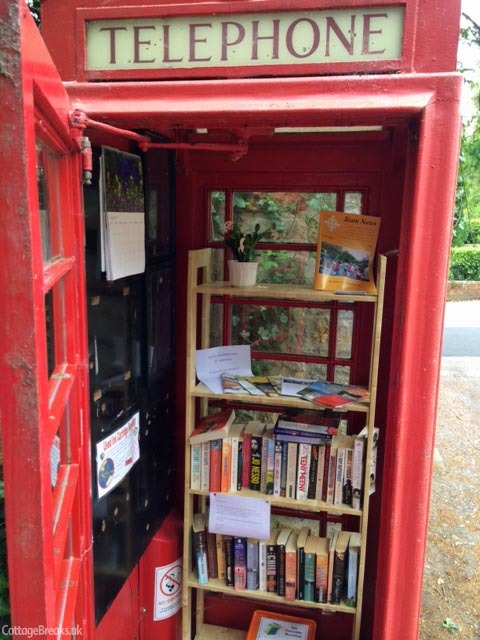 A phonebox in the village has been turned in to a mini library and information point. 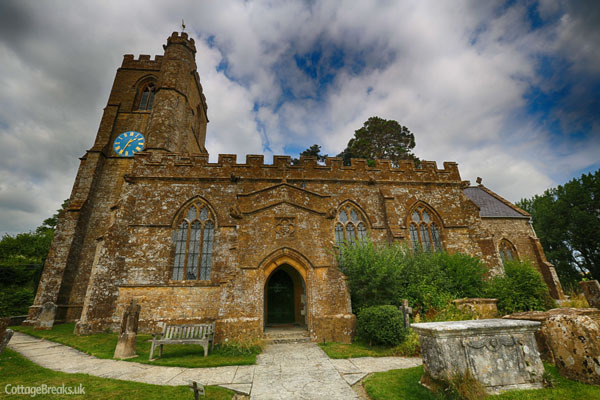 Netherbury Village has its own hyperlocal blog where you can learn more about the village and what’s happening there – a visit is recommended if you’re in West Dorset. 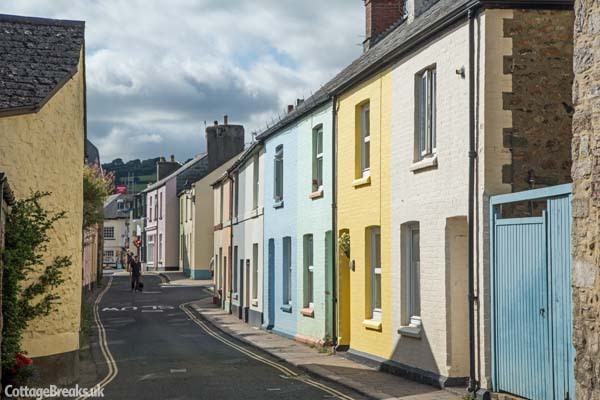 South Brent in Devon is a village close to the A38 (Devon Expressway) with pretty pastel-coloured houses, a good range of local shops and a couple of pubs, too. With a population of about 3,000, this attractive location was originally a woollen and market centre that played host to two annual fairs. 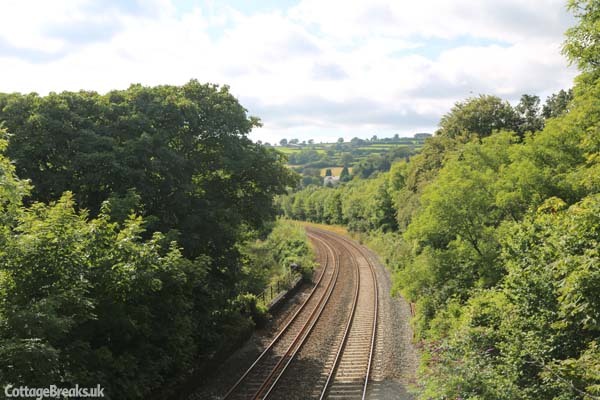 CottageBreaks.uk recently paid a visit to South Brent – here are some photographs. St Petroc Church with an impressive Norman tower. 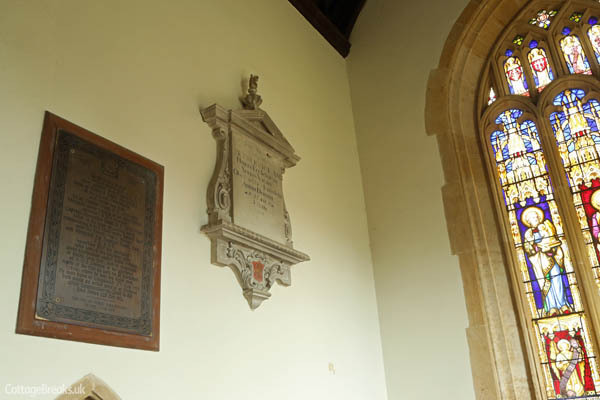 Amongst the monuments at the church is one for Sir William Cuming who was a captain under Lord Nelson and indeed South Brent has a Nelson Terrace amongst its road names. 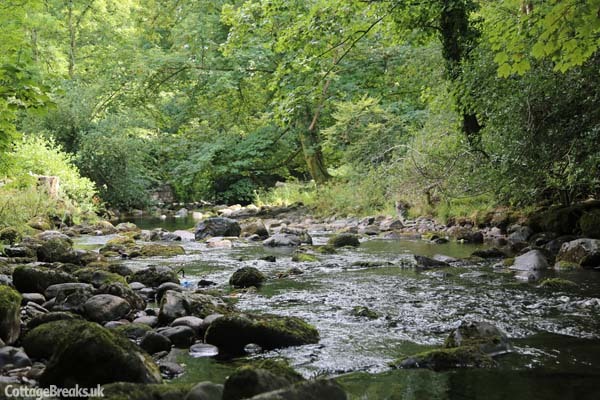 As you stand in the grounds of the church you will hear the gentle sound of the River Avon streaming past close by. A meander around the village reveals a good range of shops including a pharmacy, cafe, fish and chips, gifts and a mini market. Also pictured here is the Old Toll House, which dates back several hundred years and now contains lots of information, leaflets and guides for visitors. 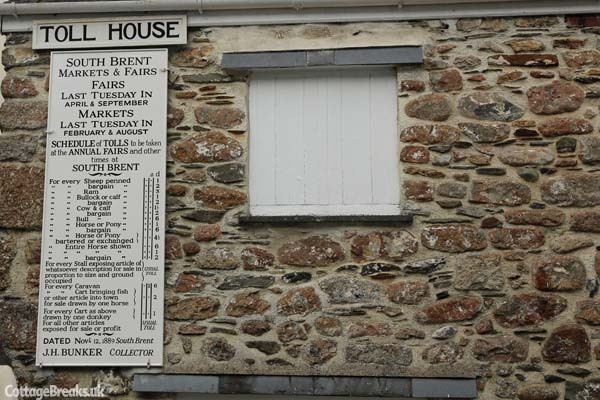 Sign on the listed Toll House refers to the markets and fairs that were held in South Brent. 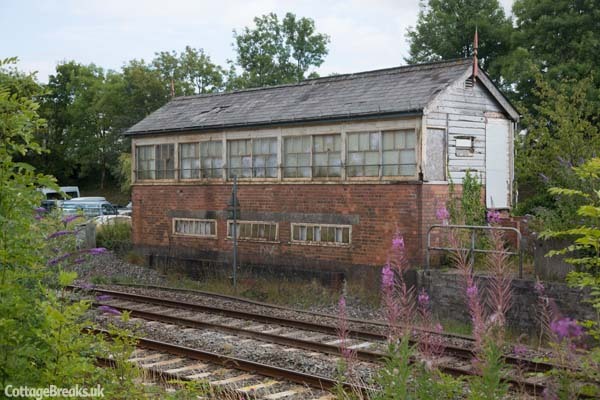 South Brent’s railway station closed in 1964. 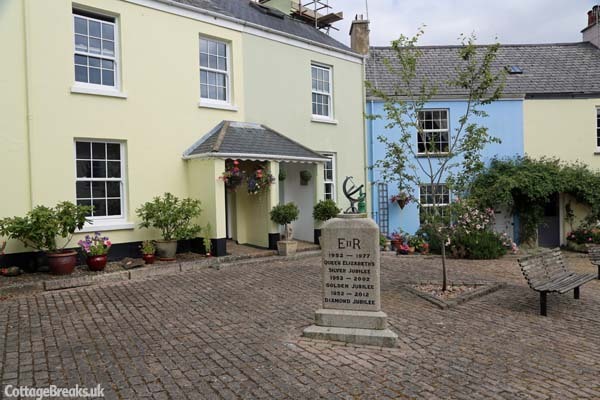 HM The Queen’s Silver, Golden and Diamond jubilees are all marked on this monument in the village. 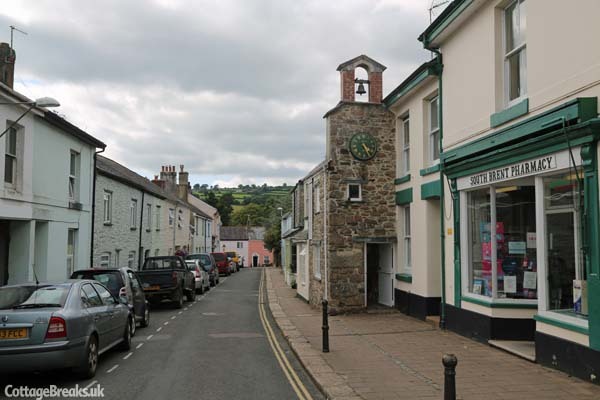 South Brent is a beautiful village with good local facilities (special mention must go to the exceptionally clean and well maintained public toilets) and very much deserving of a visit. There’s more information available on the South Brent Community Website.